The Ulysses Historical Society Museum is closed for the season as of December 1. The Museum will open again on Saturday 13, 2019. Museum volunteers work every Monday from 9-11 a.m throughout the winter. If you would like to purchase a book or do research you are welcome to stop by. The front door will be locked but you can enter through the back door of the building. April 3Docent Orientation at 2:00 p.m. April 27A celebration of the life of Pandora (PJ) Peabody held by her family from 2-4 p.m. Anyone who knew Pandora or knows her family is welcome to attend. Museum tours will be provided by our docents. April 30Ed Brown will present a discussion and slide show program called Old Trumansburg at 7 p.m. Refreshments will be served after the presentation. Everyone is welcome! You'll be sure to learn something you didn't know about the "Burg." May 11Annual Spring Luncheon at noon. The theme of this year's presentation is "Three Centuries of Wedding Gowns and Bridal Accessories" with lovely examples from our extensive clothing collection. A delicious luncheon will once again be catered by Carol Vanderzee from The Falls Tavern. Tickets are $15 and must be purchased in advance. You can purchase them at UHS during open hours or you can reserve tickets by calling UHS (leave a message) or contact Joan Hogan at (607) 387-6648 or wpjhogan@twcny.rr.com. May 14The Daughters of the American Revolution will be holding a private meeting for members at 10:30 a.m. May 21Trumansburg Central School Budget Vote at the Museum, 39 South St. 8 a.m.- 9 p.m. September 21The First Baptist Church of Trumansburg will hold their Bicentennial Celebration from 2-4 p.m. Everyone in the community is welcome and tours of the museum will be provided by our docents. December 7Our Annual Christmas Open House from 12-4 p.m. The Ulysses Historical Society is pleased to offer for sale the newest and last book by beloved local author and UHS member, the late Joe Baldwin. 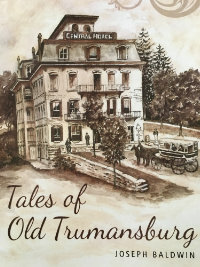 Tales of Old Trumansburg is a compilation of his popular newsletters, completed before his death in October 2017. It was his final labor of love for the village where he spent his whole life and to which he contributed so much. His stories bring to life the people and events that were instrumental in creating our beloved village. It includes over 120 historic photographs. Tales of Old Trumansburg will be on sale from the Ulysses Historical Society or at the Ulysses Philomathic Library. The cost is $21 payable by cash or check only. Checks should be written to The Ulysses Historical Society. We will also mail books to you or others for a small extra fee of four dollars per book bringing the cost of books being mailed to $25. If you would like to buy or order a book you can stop by the Ulysses Historical Society during open hours or on Monday from 9-11 a.m. during the winter. The Ulysses Philomathic Library has open hours from 10 to 5 on Monday, Wednesday, and Friday, 10 to 8 on Tuesday and Thursday and 10 to 2 on Saturday. If you wish to order books to be mailed, please contact or visit the Historical Society.